Blackbirds are causing problems again. Some growers have said that blackbirds are worse in certain areas. We have large roosting areas along the Chattahoochee river here and it may cause it to be a worse problem locally. Here’s a link back to another post I’ve done with some remedies. 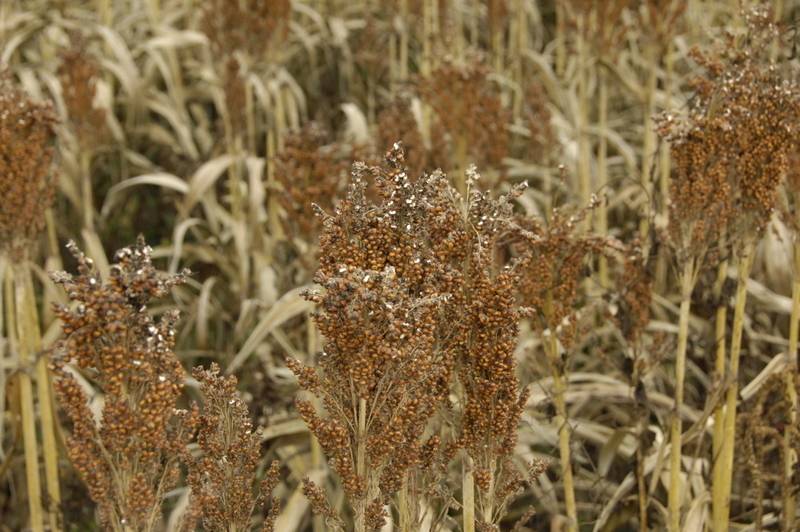 Here are some photos I took last week of the problem in grain sorghum. The propane exploders help. I like these because they move around and so the main blast of noise goes into different directions. Pecans didn’t do very well this year mainly due to rainy weather making the scab disease worse. One thing that may help some is proper pruning, to allow light penetration and more air movement. Pruning lower branches so that equipment can move freely is also important. 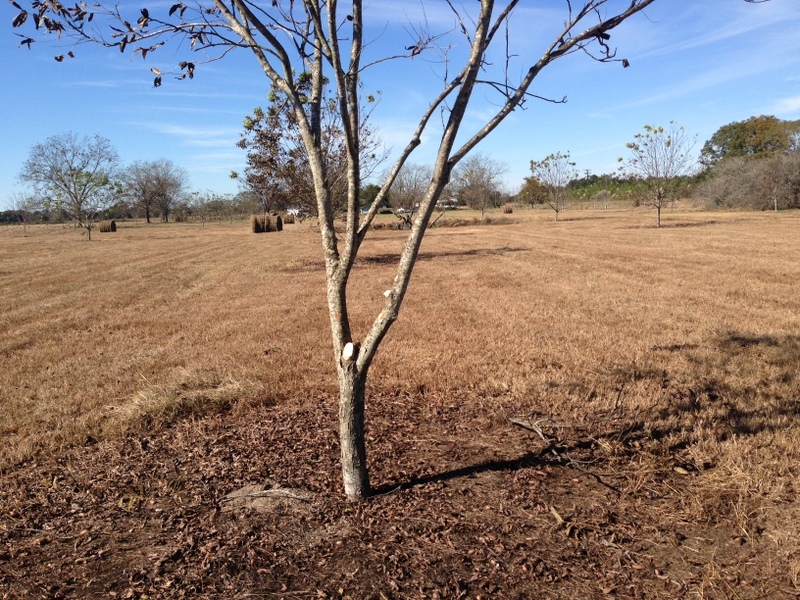 We are rapidly approaching the dormant season for pecans and that means pruning time. 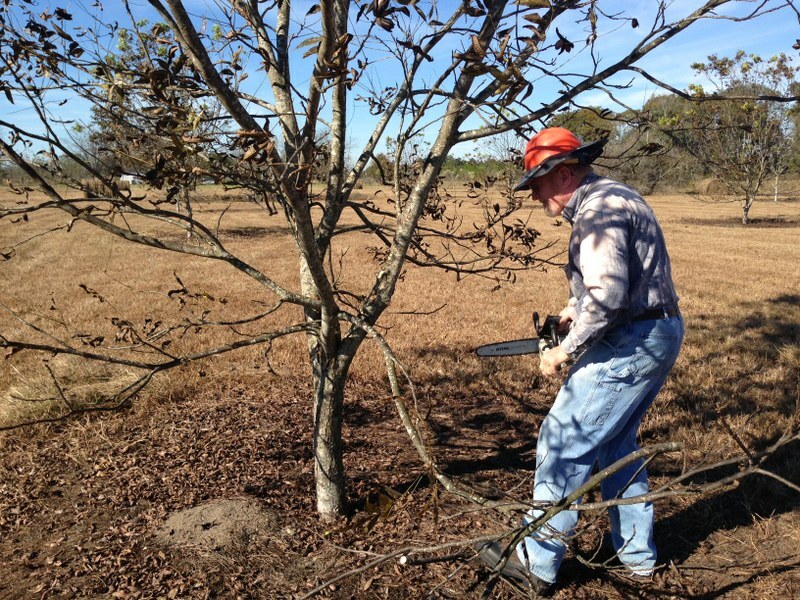 Here’s Richard Spooner doing some pruning on some young pecan trees. There are before and after shots. During the late 1800’s, landowners began to recognize the potential profit of pecans in the southeastern United States. By the late 1800’s, several individuals near Savannah, Georgia had produced and marketed pecans on a small scale. By 1889, there were only 97 acres of pecans planted in Georgia. Thousands of acres of pecan trees were planted in southwest Georgia between 1910 and 1925. Most of these trees were initially planted as real estate investments rather than for nut production. 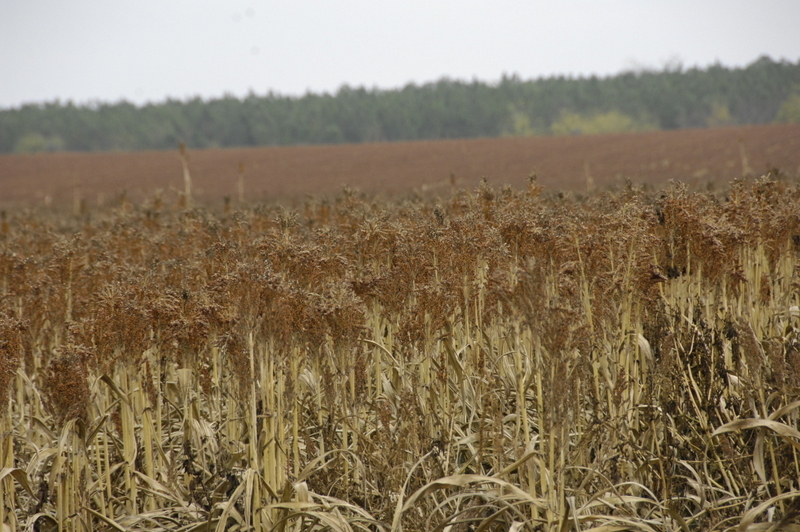 Thousands of acres were sold in five and ten acre units, primarily in Dougherty and Mitchell Counties, which are still today the hub of Georgia’s pecan producing counties. By 1920, Georgia was producing 2.5 million pounds of pecans. By the 1950’s, Georgia was ranked as the top state in the nation for pecan production. Today, Georgia pecan orchards may range in size from just a few trees to several thousand acres. The state continues to be regarded as the top pecan producing state in the U.S., with over 144,000 acres planted to pecans. An early harvest date compared to other areas of the nation which produce pecans often results in good prices for Georgia pecan growers who produced $233,941,290 in farm gate value during 2010. Last week I had a photo of some rye cover crop that had been planted with a drill and the grower stopped up every 5th hole so that there will be a gap where the ripper shank and the row of cotton will be planted next spring. He’s counting on the rye cover to help with pigweed. 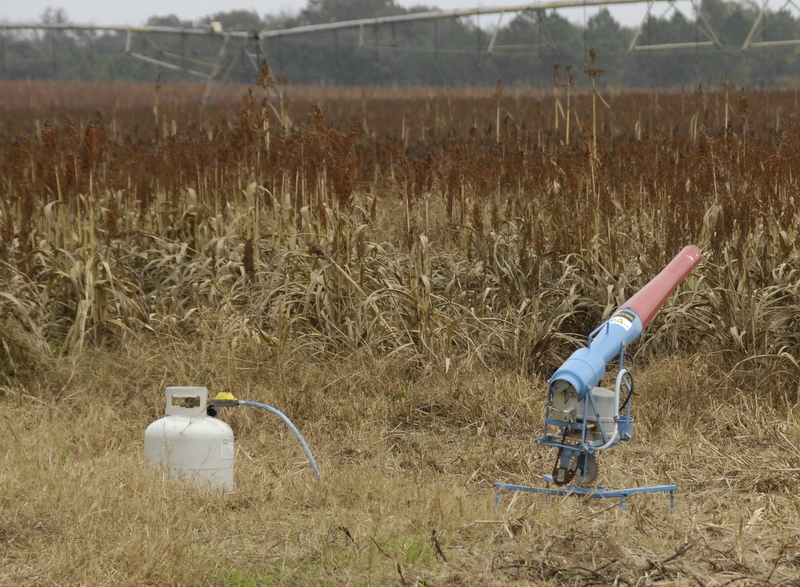 Here’s a great video by Dr. Stanley Culpepper, UGA Extension Weed Scientist, that discusses and shows how to have a good rye cover crop and how to manage it to help with pigweed problems in cotton. This week I have a sad photo that I took last week. Tell me what it is and what happened? Food is still a good deal in the US. If you complain about the farmer don’t do it with your mouth full. I’ve thankful for our farmers and everyone associated with agriculture. Here’s some information from the Farm Bureau about the cost of our Thanksgiving meal. The American Farm Bureau Federation’s 28th annual informal price survey of classic items found on the Thanksgiving Day dinner table indicates the average cost of this year’s feast for 10 is $49.04, a 44-cent price decrease from last year’s average of $49.48. “The cost of this year’s meal, at less than $5 per serving, remains an excellent value for consumers,” said AFBF President Bob Stallman, a rice and cattle producer from Texas. “America’s farm and ranch families are honored to produce the food from our nation’s land for family Thanksgiving celebrations,” he said. “This year we can be thankful that Thanksgiving Dinner, a special meal many of us look forward to all year, will not take a bigger bite out of our wallets,” said John Anderson, AFBF’s deputy chief economist. “Most Americans will pay about the same as last year at the grocery store for a turkey and all the trimmings. Slightly higher turkey production for much of the year coupled with an increase in birds in cold storage may be responsible for the moderate price decrease our shoppers reported,” he said. In addition to the turkey, other items that declined in price included a dozen brown-n-serve rolls, $2.18; one pound of green peas, $1.54; a 14-ounce package of cubed bread stuffing, $2.67; fresh cranberries, $2.42; a half pint of whipping cream, $1.85; and two nine-inch pie shells, $2.49. Items that showed a moderate price increase from last year included three pounds of sweet potatoes, $3.36; one gallon of whole milk, $3.66; and a 30-ounce can of pumpkin pie mix, $3.10. In addition, a combined group of miscellaneous items, including coffee and ingredients necessary to prepare the meal (onions, eggs, sugar, flour, evaporated milk and butter) increased to $3.20. A one-pound relish tray of carrots and celery increased to 81 cents. The average cost of the dinner has remained around $49 since 2011. Further, Anderson noted that despite retail price increases during the last year or so, American consumers have enjoyed relatively stable food costs in general over the years, particularly when adjusted for inflation. 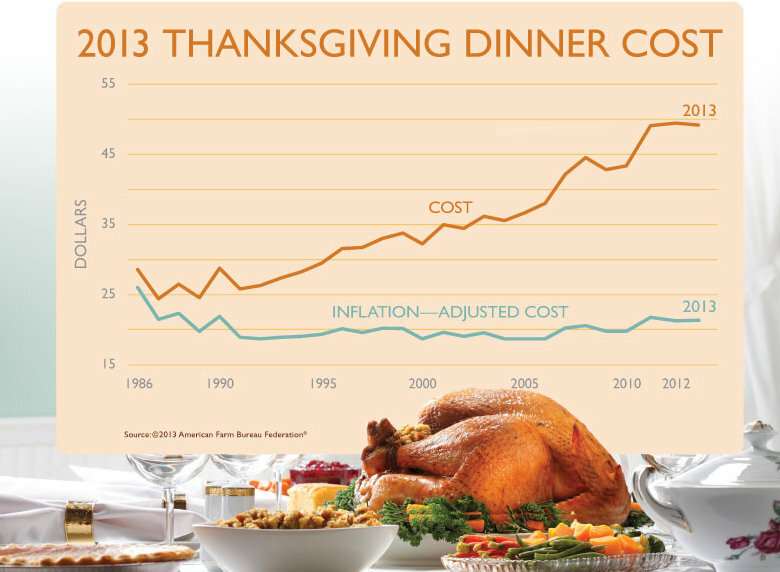 The stable average price reported this year by Farm Bureau for a classic Thanksgiving dinner tracks closely with the government’s Consumer Price Index for food eaten at home (available online at http://www.bls.gov/news.release/pdf/cpi.pdf), which indicates a 1 percent increase compared to a year ago. The Southeast Regional Fruit and Vegetable Conference is the LARGEST educational conference and trade show in the southeastern United States that unites growers, vendors and suppliers. Anyone with an interest in specialty crop agriculture is invited to be a part of this event to address food safety, specific commodity sessions on production practices and increased yields, marketing strategies, and interact with key suppliers and growers. This event will be held January 9-12, 2014 at the Savannah International Trade and Convention Center! For more information go to: http://www.seregionalconference.com/ and from there you can register and find out more information about the conference. 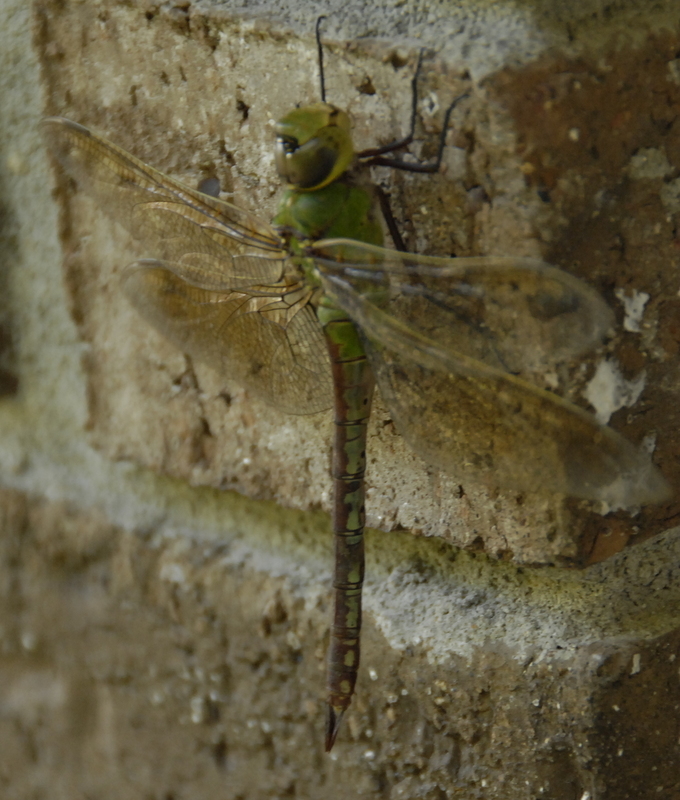 Last week I asked about an insect and it was the dragonfly. In their immature larval stage, which can last up to two years, dragonflies live in the water and are feared hunters of tadpoles, mosquitoes, tiny fish, other insect larvae and even each other. At the end of its larval stage, the dragonfly crawls out of the water, then its exoskeleton cracks open and releases the insect’s abdomen, which had been packed in like a telescope. 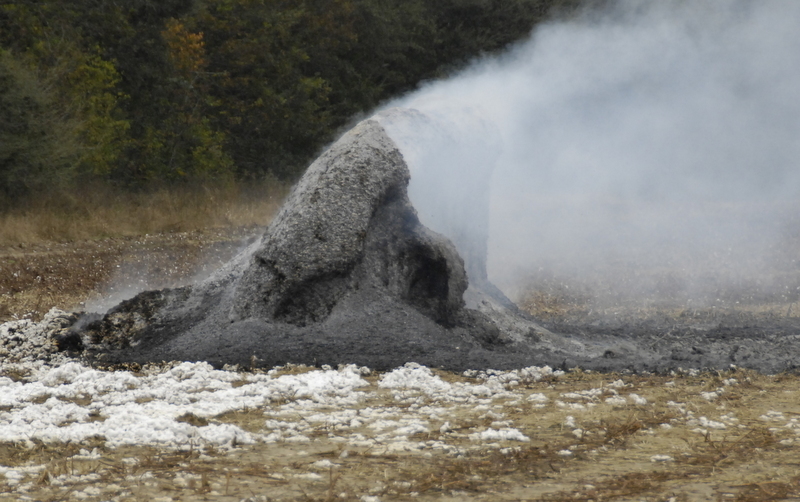 Its four wings come out, and they dry and harden over the next several hours to days. Dragonflies are expert fliers. They can fly straight up and down, hover like a helicopter and even mate mid-air. Dragonflies can flap or beat their two pairs of wings independently. This means the front wings can be going down while the back ones are coming up. If they can’t fly, they’ll starve because they only eat prey they catch while flying. Dragonflies catch their insect prey by grabbing it with their feet. Some adult dragonflies live for only a few weeks while others live up to a year. Nearly all of the dragonfly’s head is eye, so they have incredible vision that encompasses almost every angle except right behind them. Dragonflies, which eat insects, are a great control on the mosquito population. A single dragonfly can eat 30 to hundreds of mosquitoes per day. Most of this dragonfly information is from the Smithsonian institute. 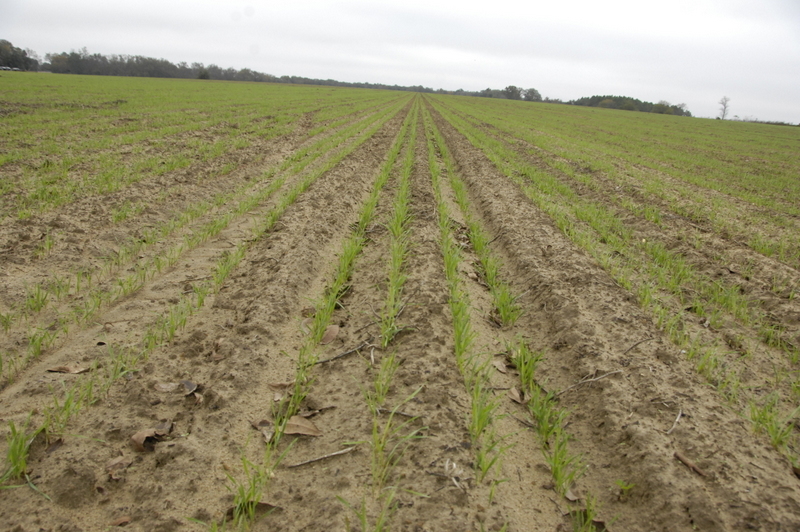 This week I have a photo I took of a field with rye planted in 7.5 inch rows but every 5th row is skipped, why? The Market Hog Youth 4-H and FFA project is a good one that teaches a lot to the youth that participate in it. 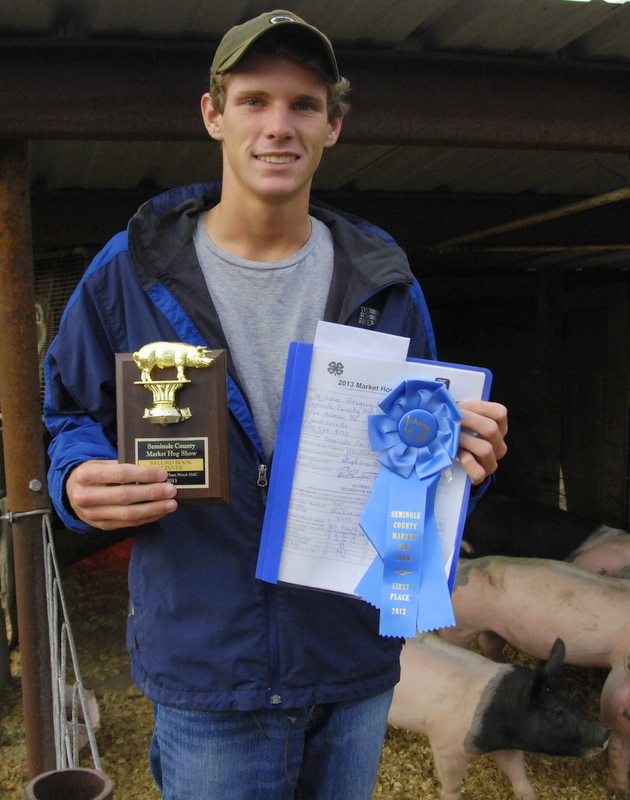 Will Mims won first place in the 2013 Seminole County Chamber of Commerce Market Hog Recordbook Contest. He does an excellent job with the swine project. The Mims have used gilts that Will and his sister Katibeth have shown in the past to breed and have new showpigs there on the farm. So it’s an all year project for the Mims kids. 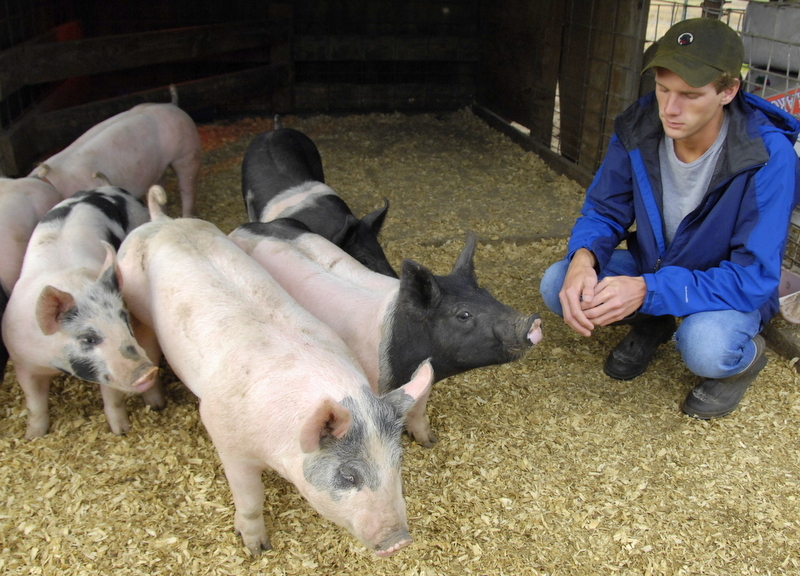 They also help other young people with their show pigs on their farm. 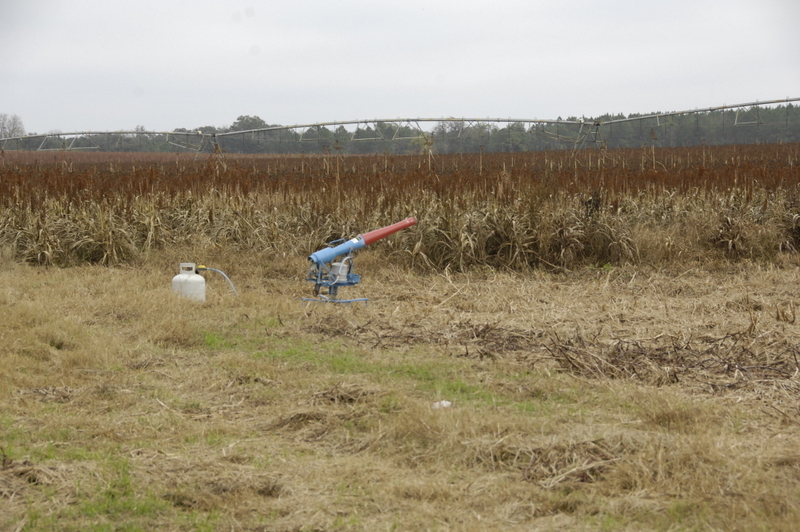 He and his family also grow most of the corn used in their hog feed that they formulate and grind themselves. Other winners in the recordbook contest are Jesse Ethredge, second place and Brooke Hornsby, third place. Here are some of this year’s new pigs that will be shown in our February 15th Seminole County Chamber of Commerce Market Hog show and the State Market Hog Show in Perry Georgia. 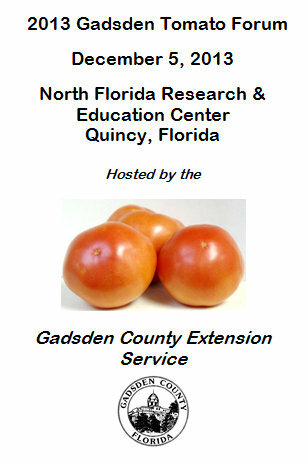 Weigh-in will be this Monday from 2 to 5 pm on Nov. 25th at the Seminole County Ag Center. 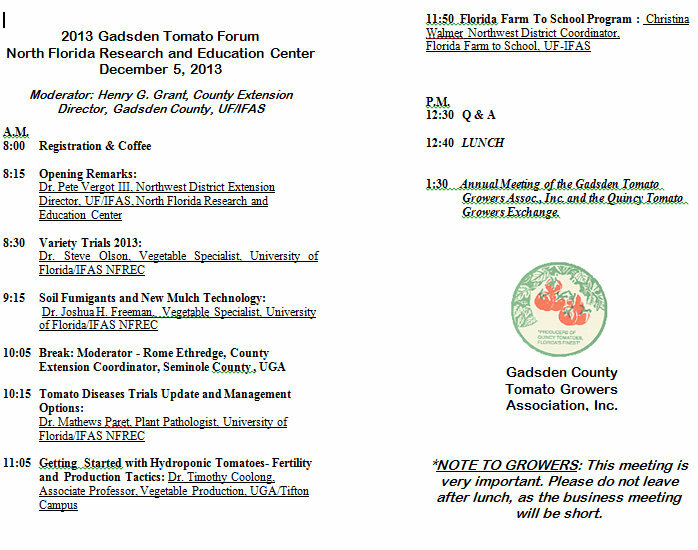 An informational forum will be held in Quincy Florida concerning commercial tomato production. 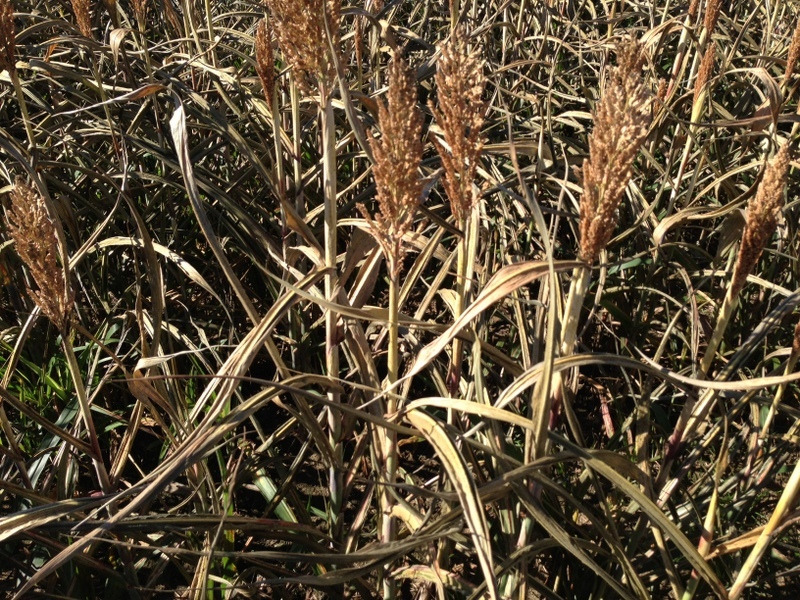 The frost last week put a halt to our sorghum silage crop. This field was rattooned in the summer. It was harvested for silage and then refertilized and it grew another crop. But the freeze got it before it was all the way ready to ensile again but it will still do pretty well. 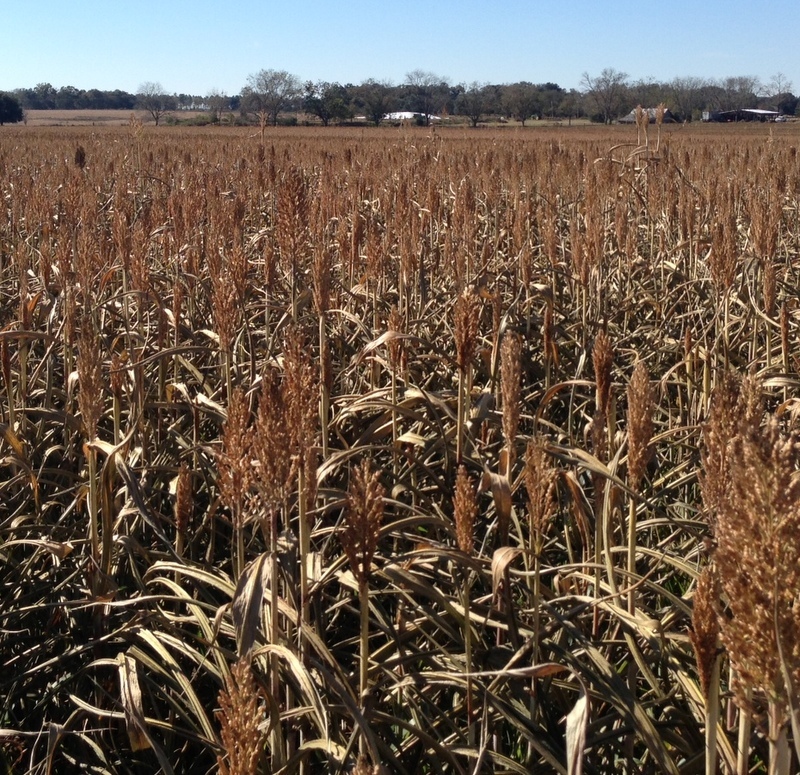 Here are some comments about ensiling this sorghum by Dr. John Bernard, UGA Animal Science Feeds Scientist. “I would wait for a minimum of 3 to 4 days if light frost or 6 to 7 days if a killing frost to let the prussic acid content decrease and then cut it for silage. Fermentation will also reduce any remaining prussic acid remaining. 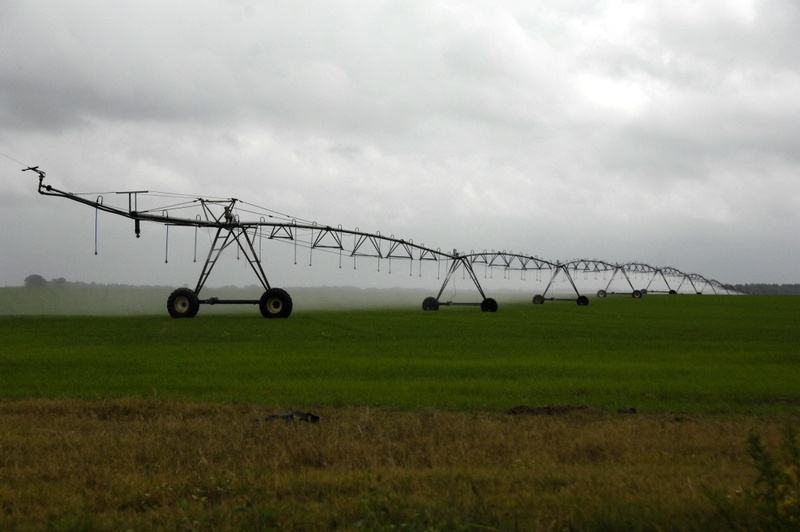 Twenty years ago, we in south Georgia farming country were all lulled to sleep on dry summer nights by the drone of diesel engines all around, pumping water for our crops. Now it is quiet at night due to the diesels being converted to quiet electric run pumps. Here’s an opportunity if there are some that haven’t been converted yet. Thanks to Calvin Perry of the Striping Irrigation Park for letting me know about this.